A resonant debut novel about retreating from the world after losing everything—and the connections that force you to rejoin it.Since the night of the crash, Wren Wells has been running away. Though she lived through the accident that killed her boyfriend Patrick, the girl she used to be didn’t survive. Instead of heading off to college as planned, Wren retreats to her father’s studio in the far-north woods of Maine. Somehwere she can be alone.Then she meets Cal Owen. Dealing with his own troubles, Cal’s hiding out too. When the chemistry between them threatens to pull Wren from her hard-won isolation, Wren has to choose: risk opening her broken heart to the world again, or join the ghosts who haunt her. 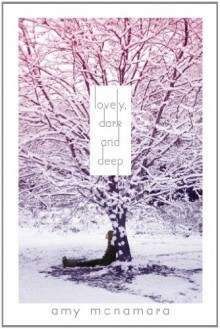 http://hadytangible.booklikes.com hadytangible 3.5 Lovely, Dark and Depressing..
text Lovely, Dark and Depressing.. It's fantastic how Amy writes, but this wasn't for me, it was toooo depressing, I don't even remember why I started reading it, lovely cover though. I had to resort to skimming to finish. The style didn't work for me in a novel.